Nitrogen has been used for over 20 years by the Airlines, Military, NASCAR and Industry...WHY? 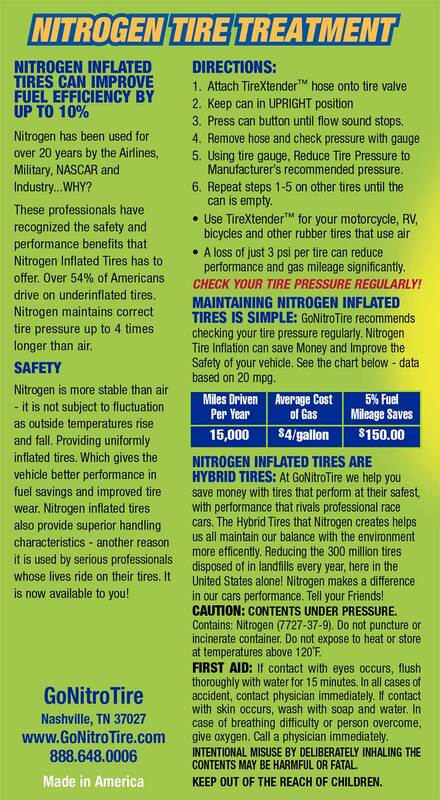 These professionals have recognized the safety and performance benefits that Nitrogen Inflated Tires has to offer. Over 54% of Americans drive on underinflated tires. Nitrogen maintains correct tire pressure up to 4 times longer than air. • A loss of just 3 psi per tire can reduce performance and gas mileage significantly. Check your tire pressure regularly! Maintaining nitrogen inflated tires is simple: GoNitroTire recommends checking your tire pressure regularly. 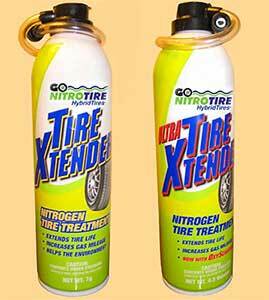 Nitrogen Tire Inflation can save Money and Improve the Safety of your vehicle. Nitrogen Inflated Tires Are Hybrid Tires: At GoNitroTire we help you save money with tires that perform at their safest, with performance that rivals professional race cars. The Hybrid Tires that Nitrogen creates helps us all maintain our balance with the environment more efficiently. Reducing the 300 million tires disposed of in landfills every year, here in the United States alone! Nitrogen makes a difference in our cars performance. Tell your Friends!